Smart phones have effectively penetrated virtually just about every facet daily lives, but there is one segment of the population that remains underserved; public transit users. For some time now, the “cutting edge” solution to transit tickets has been either paper-based cards or contactless cards. However, for an increasingly paperless society these solutions simply won’t do any longer and some U.S. transit authorities are taking notice. The natural progression of technology would see the implementation of a plastic, reusable card that could be used for subway, bus, ferry, commuter rail, park-and-ride garages and coffee shops in transit stations. But some are looking beyond the cards in the hopes of finding a more fitting and contemporary solution. As reported by The Atlantic Cities, the adoption of the smart phone has made plastic, reusable transit cards a dead-on-arrival technology. Mobile ticketing is an idea that is gaining a great deal of momentum and is a solution that just makes more sense. This past November saw the Massachusetts Bay Transportation Authority (MBTA) introduce a a transit ticketing solution for the mobile device. MBTA’s approach seems to be paying off as the agency reported that is had passed the million-dollar mark selling single, 10-trip and one-month passes for its commuter rail system through the new app. MBTA’s success has led the agency to plan a concept idea for a system that could expand to include buses and metro service in other cities. What mobile ticketing provides is a guarantee that your ticket office could be anywhere, even in your back pocket. MBTA conducted a surveyed of commuter rail passengers last June about this very idea and roughly half stated an interest in trying it out. Additionally, 76% of surveyed riders reported owning a smart phone — up from 66% in 2011. Scanning mobile tickets at a security gate is an idea that many people are already familiar with at Amtrak stations or airports. The difference is, however, that most airport customers buy their tickets via computer and receive their ticket through email on their smart phone. With mobile public transit ticketing, the phone could act as both the vendor and the ticket. 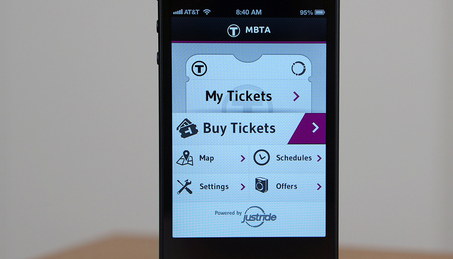 MBTA — alongside UK-based partner Masabi — maintains an app that enables customers to purchase tickets for future use with the mobile device. 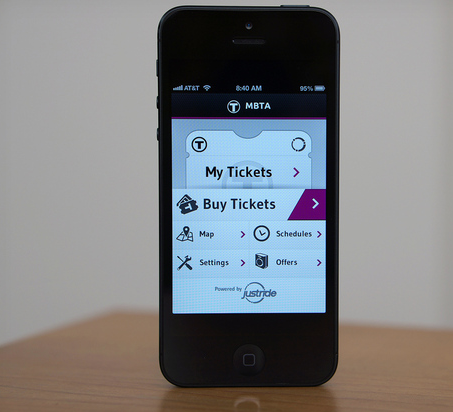 When riders are ready to activate and use their purchased tickets, the app displays visually encrypted patterns on the phone’s screen for the conductor who subsequently scans the on-screen image. Using a scanning method developed by Masabi, conductors can use either a camera-equipped smart phone or dedicated scanning portable hardware. The visual validation application allows conductors to view ticket color sequences to ensure validity. Masabi’s scanner application can provide validation and reporting of barcode, NFC and smartcard tickets from a handheld device. Additionally, Masabi’s barcode technology enables conductors to validate tickets without the dependence on Wi-Fi or mobile data connections. Single-ride tickets and monthly passes are currently available through the new app, and are accompanied by a barcode that conductors will be able to spot-check with an iPhone scanner in the future. Since the solution’s implementation back in November, MBTA has reported that roughly 12% of all 10-ride tickets, 6-10% of single rides and 7% of monthly passes are being purchased through the mobile ticketing method.